Colorful candy displayed in the window of a store in the village of Gourdon of the Provence, France in Europe. The village of Gourdon of the Provence, France in Europe has many unique stores but it is very hard to bypass the delightful array of candy in this store. Anyone with a sweet tooth will be sure to stop and sample some of the incredible candy that Gourdon in France has to offer.In this store you will find your favorite flavor of candy in an assortment of styles. Suckers and sticks of brilliant colors, small suckable candies and peanuts are just a few of the sweets available for sale in Gourdon, France.When you walk into this candy store you are reminded of the movie "Willy Wonka and the Chocolate Factory" where every treat you ever wished for is at your fingertips. Not only is the candy worth trying for yourself but you can get beautiful gifts of sweets to take home to your loved ones.Sweets at a candy store in the village of Gourdon, Alpes Maritimes, Provence, France, Europe. 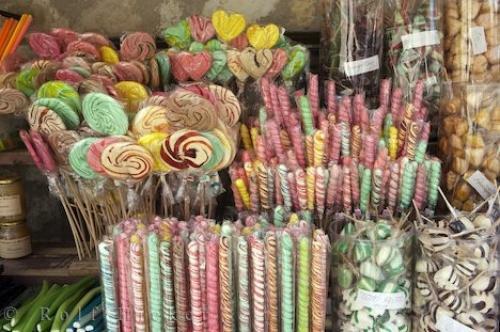 Photo of a variety of candy flavors in a candy store in Gourdon village in France, Europe.